MARCH 19, 2017 @ 3 pm. 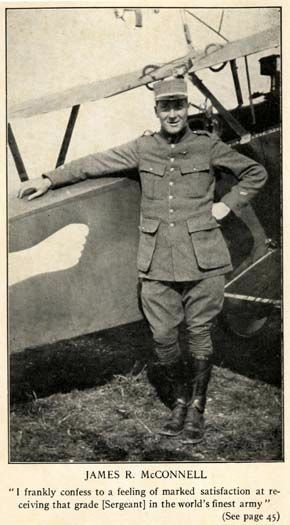 During WWI, in aerial combat with two German planes, James R. McConnell of Carthage N.C. died on March 19, 1917 above the Somme battlefields. He was buried in a meadow where he fell, between the villages of Flavy-le-Martel and Jussy, in Aisne, France. This small village of 1600 people, erected, and to this day has maintained, a monument in remembrance of the day that the American pilot of the French Lafayette Escadrille was downed and died. A monument dedicated to James R. McConnell, at the Gilliam-McConnell Airfield, displays the actual plaque. In 2015, a large mural was painted at McNeill and Monroe Streets, in the center of Carthage, to memorialize the valor of our local hero. At the mural location, on March 19, 2017, the town of Carthage will pay tribute to James R. Mc Connell, on the centenary of his death. The James McConnell Air Museum will be dedicated during the event. On the same day, in the French village of Flavy- Le-Martel, the Town Municipality will conduct a similar ceremony. Local authorities, the media, and others will be present at these important occurrences which will commence at 3pm, in the USA, and 8pm in France. The ceremony will feature a static display of a WWI airplane, and the presence of local authorities. The Color Guard of the Sandhills Area, Detachment #1001 of the Marine Corps League will lead, followed by an invocation, the Pledge, the singing of the National Anthems, and several short speeches, including one from the niece of James R. McConnell. The Bandit Flight Team will make a formation fly over, at the time of the dedication. The French Honorary Consul will also be present. In case of rain, we will meet at the First Presbyterian Church, 110 South Ray Street, Carthage N.C. 28327. across the street from the Post Office. James R McConnell Air Museum, Carthage, N.C.
3 00 Opening – Roland Gilliam, President M.C. 3 05 Posting Of Colors – Sandhills Area Detachment #1001 of the Marine Corps League. 3 45 J.R. McConnell Air Museum Dedication – Roland Gilliam & J.R. McConnell’s niece. 4 00 Retrieving of the Colors. In case of rain, we will meet at the First Presbyterian Church,110 South Ray Street, Carthage N.C. 28327. Across the street from the Post Office.